In honor of Match Day, we are publishing pieces written by MS4s. On Monday, we published a piece on Penn Med’s awesome student body. Today, MS4 Kenji Taylor shares how he explored his interests in primary care and family medicine for the underserved, at Penn Med and beyond. The young man greeted us politely yet anxiously, with the characteristic roll of the ‘R’ that we had been practicing for the past four weeks in Botswana. He had traveled two hours to see the specialist doctors from the United States because he was concerned about his heart. 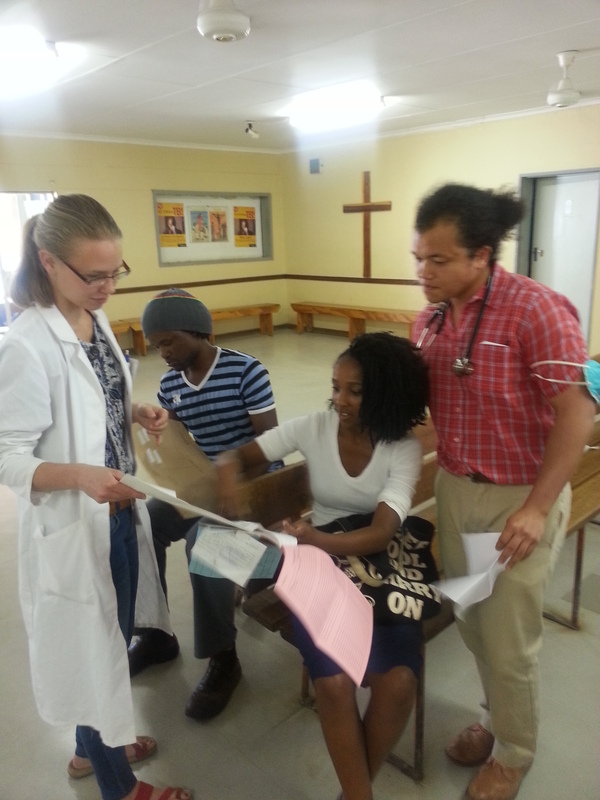 With the Botswana doctor and a medical student from Germany, we examined the patient and reviewed his EKG. Assured by the physical exam and other data we had, we suggested that he come back in the next two weeks to provide continuity in care and make sure he was well. As he thanked us, my attention turned to the hot room overflowing with children, men and women of all ages who had been waiting patiently since the early morning to be seen by the primary care specialists. I am living a dream: providing full spectrum primary care to underserved communities. Through the Botswana-UPenn program, I am spending seven weeks in several different hospitals, both in urban and rural settings, practicing inpatient and outpatient medicine with local clinicians, Penn residents and faculty. Already almost four weeks in, I’ve learned so much about diseases endemic to the region like TB and HIV, adjusted to relying purely on a history and physical exam when other tests aren’t readily available, gained an appreciation of Botswana customs around health, and developed a better understanding of the system of primary care. I credit my time at Penn Med as the reason I was able to develop my interests in the specialty of Family Medicine and practicing medicine with undeserved communities both in the US and abroad. During my first three years of medical school, I helped build The Cut Hypertension Program with fellow classmates. This program sends students of all health professions into African American barbershops in our West Philadelphia neighborhoods to provide blood pressure screenings. Ultimately, the program aims to reduce the stark disparity of cardiovascular disease that African American men face. I’m proud to say The Cut Hypertension Program continues to flourish in Philadelphia, and most recently in Atlanta, with the help of grants from the Schweitzer Foundation and United Health Foundation. Faculty mentorship from across the University in Family Medicine, Nursing, the Center for Public Health Initiatives, Wharton, General Internal Medicine and the Center for Behavioral Economics has been immense. It is a real strength of the medical school program that cannot be understated. With support and encouragement from faculty, I decided to take a year out from medical school and accepted a paid fellowship position with the Centers for Disease Control in the global maternal-child HIV group. It was during this year I augmented the excellent clinical training we receive as Penn students with the perspective of public health. I kept in touch with faculty mentors throughout my time with the CDC in order to help me keep my experiences in the context of patient care and help me transition back into my final year. The strengths of medical education at Penn extend far beyond a second-to-none curriculum and training facilities. The exposure, leadership opportunities and faculty mentorship are phenomenal. I often did not fully appreciate these things until I left the University and realized how lucky we were to have so many resources and opportunities at our fingertips. Regardless of what your interests are in medicine, you can find the mentorship and guidance you need to help you realize those dreams. Kenji Taylor is an MS4 from small towns in rural Kansas and Pennsylvania. He graduated from Brown University in 2008 where he majored in Neuroscience and East Asian Studies. He then worked for a couple of years in finance in LA, London and Tokyo before coming back to medicine. Outside of class, Kenji enjoys hiking, fitness, cooking and watching Hulu with his girlfriend. In our previous post, MS1 Chris Corbett shared his experience so far with the LEAPP program. Today, MS3 Sarah Huepenbecker shares how LEAPP impacted her medical education over the last two years. When I first met my LEAPP patient, Ms. M, I knew I was going to have an enjoyable experience. She was easily the most gregarious patient in the dialysis unit, and greeted my LEAPP partner and I with a huge smile and hugs. Her outfit and accessories were completely color-coordinated (a recurrent theme), and her blonde curls swung jauntily (a non-recurrent theme, as each subsequent visit introduced a new wig). She launched right into her life story, telling us all about her career as “the dancing barmaid,” her two trouble-making sons, and her new fiancé. It took us a while to steer her towards telling us about her chronic disease: end-stage renal disease secondary to hypertension and diabetes. In some ways, she had remarkably good insight and knowledge about her disease process—she could explain why she needed a low-salt diet, how the dialysis machines purified her blood three times a week, and the specific symptoms of uremia (a term I only vaguely understood at the time). I was struck by how upbeat Ms. M was about her diagnosis and prognosis—she enjoyed seeing her friends at dialysis three times a week, loved her nephrologist, and had lots of plans for her future. This initial impression was a lasting one, and I always looked forward to my sessions with Ms. M. As my LEAPP partner and I met with her more often, we were able to get to know Ms. M as a vibrant person instead of just as a patient. By learning about Ms. M’s life outside of her disease, I was able to appreciate how various psychosocial, emotional, religious, and financial variables factored into her health. For example, a few months after our initial meeting, Ms. M moved into a new apartment, which was both more affordable, allowing her to spend more money on fresh foods and maintain a renal-friendly diet, and closer to the bus stop, allowing her to travel to and from dialysis more easily. On the other hand, when Ms. M’s brother died unexpectedly midway through our LEAPP experience, she was deeply shaken and skipped several dialysis sessions and doctor’s appointments, which ultimately led to a few ER visits. During our year and a half with Ms. M, she went to the ER 5 times and was hospitalized twice (once for a clot in her dialysis fistula, once for a leg wound infection). It was a humbling experience, as a budding medical student, to see the progression of end-stage renal disease up close and personal. The bigger lesson, however, was seeing how the disease impacted Ms. M’s life and hearing her perspective on her own health. Ultimately, my LEAPP experience gave me valuable insights that I will carry with me throughout my career. I had the privilege of getting to know a patient who was alternatively incredible, smart, energetic, non-compliant, scared, hopeful, and frustrating. I was able to see my patient as an utterly and beautifully human person with a life outside of her disease, and I hope to never forget that lesson as a physician. Sarah Huepenbecker is an MS3 who is interested in OB/GYN and General Surgery. She is originally from Minnesota and completed her undergraduate degree at Penn in 2012, majoring in Biology and minoring in Hispanic Studies. In her free time she enjoys running, reading, good happy hours, and guilty pleasure TV.